A contemporary fan with mass appeal, the Dempsey fits flawlessly in todays modern home. The beautiful, clean finish options work together with the high contrast of angles throughout the design to create a look that will keep your space looking current and inspired. This fan is damp-rated for covered porches or any area with lots of moisture. Fully-dimmable LED bulbs give you total control over your lighting, while the 52 in. blade span is ideal for large rooms. We have a full collection of Dempsey fans, which means you can maintain a consistent look while tailoring the size and features to each room in your house. 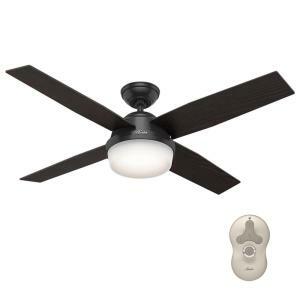 Tbook.com crawls the web to find the best prices and availability on Hunter Fanss and related Tools and Hardware products like Hunter Dempsey 52 inch LED Indoor/Outdoor Matte Black Ceiling Fan with Light. For this page, related items include products we find that match the following keywords: "Hunter Fan" at our vendor partner Home Depot. Hunter Dempsey 52 inch LED Indoor/Outdoor Matte Black Ceiling Fan with Light is one of 151 Hunter Fanss and related products listed in the Tools and Hardware section of Tbook.com If you have any questions on this product, please give us a call at 734-971-1210 during the hours of 9am - 5pm EST for assistance. Thank you for shopping at Tbook.com, the Internet Department Store!